We started using both blackmagic SDI output and NDI output and we had issues with the audio dropping in and out if all three (main stream, SDI, NDI) were on the same canvas setting, so now we keep our stream at 1080p, SDI at 720p50, and NDI 720p30, however, these settings are not saved and have to be selected each time we load wirecast. Is this a bug? Or... is there some reason these settings aren't saving? Have you updated to Wirecast 12? CraigS We have not upgraded to 12, looking in the release notes there is nothing about either issue and we've had much worse issues from using new releases that haven't had a few bug fix releases yet. The audio starts dropping after a few to 15ish minutes, it does it on SDI, NDI, and Stream, however simply stopping the SDI and NDI output stops it, sometimes just stopping the NDI output stops it, so it isn't the incoming audio nor the audio driver / wirecast interaction. Do you now why the canvas settings aren't saving? Canvas should be saved when you save the document. 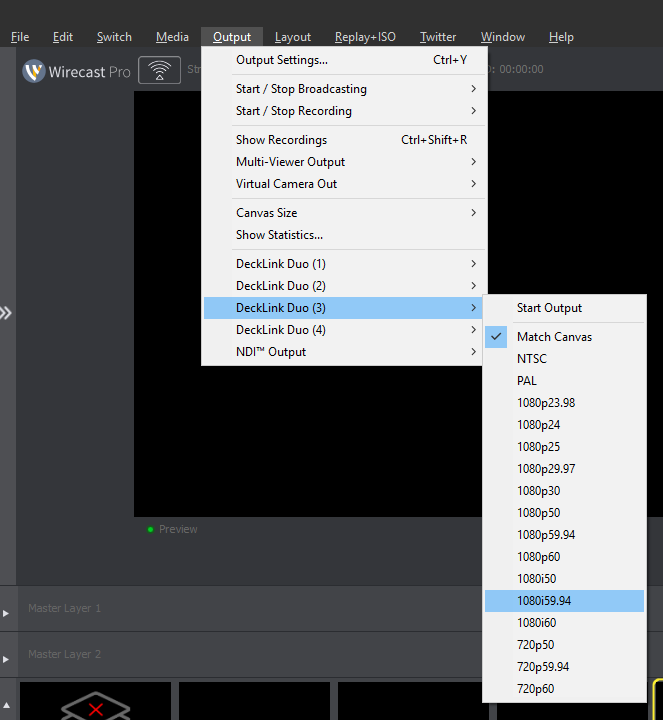 Ideally Wirecast wants to see matching Preference and Encoder frame rate so using p30 and p50 might be a problem. Preference Video Display Rate sets the processing. If you'd like an issue fixed or feature changed the developers will use the current version to determine how to handle. You can upgrade to 12, test in a new document. If it's not saving, report it and then revert back to 11.1.2. The overall canvas size does save, the output canvas / size options do not save. Are you saying the should and that's a bug? Or are you saying that their not saving is intended functionality? Using the save encoder framerate would be ideal, it just causes issues for an unknown reason. If I had to guess, I'd say the NDI output drops audio frames (which it does purposefully to avoid degradation on a network) and for some reason if the same encoder is used for all outputs, they all drop the frames. Are you saying the should and that's a bug? Or are you saying that their not saving is intended functionality? I'd think if you're opening a document using the same output device it should be saved but it might be related to the device's driver. I'd file it as a bug and we'll investigate. I'd say the NDI output drops audio frames (which it does purposefully to avoid degradation on a network) and for some reason if the same encoder is used for all outputs, they all drop the frames. Which would be a bug of course. Ideally one shouldn't impact the others.